THE proposed southside leg of the long-awaited MetroLink line is set to be massively curtailed, Independent.ie can reveal. The line will not go all the way to Sandyford as originally planned as a result of opposition from residents and fears of years of disruption to the Luas Green Line. Meanwhile, on the northside facilities for Na Fianna and Ballymun Kickhams GAA clubs are set to be protected under proposals to be unveiled by the National Transport Authority tomorrow afternoon. Independent.ie has compiled key details of the new plan from a number of sources. 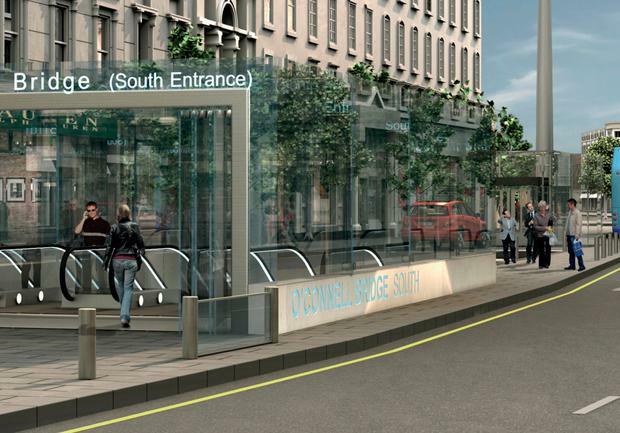 The Metro will run from Swords to Charlemont Street to meet the existing Luas service. The Metro won't continue down the Green Line to Sandyford as had been proposed. Underground drilling is to continue as far as Ranelagh to allow for expansion in future years. Green Line Luas services are to be upgraded over the next decade to allow for a 55-metre tram every two minutes to combat increasing congestion. The tunnel will be single bore. It is understood the preferred route will be announced by the National Transport Authority (NTA) and Transport Infrastructure Ireland (TII) tomorrow. However, a fresh period of public consultation is to be opened up until mid-May. The project will then move quickly to the planning stage. In what is likely to be a controversial move, it is now proposed that tunnel boring will be completed through Ranelagh even though the Metro won’t go to the village. Sources said it will be cheaper to keep tunnelling now to allow for future expansion, rather than trying to start again in future years. “By that stage it’s hoped further development would be less disruptive to commuters,” a source said. The costs of short Metro line is unclear at this stage. An international expert in megaproject planning and management, Professor Bent Flyvbjerg from Denmark, is to be brought in to oversee the costings. He has worked as a consultant to the EU Commission, and the United Nations, and has been an adviser to the UK, Dutch and Danish governments in formulating national policies for infrastructure, environment, transportation, and science. The original plan would have seen the MetroLink go underground as far as Charlemont and then continue overground along an upgraded Luas Green Line. The Rethink MetroLink South City group said it would mean segregation by a “Berlin Wall” during construction. The campaigners were backed by a number of high-profile politicians, including housing minister Eoghan Murphy. Another option that emerged last month – a plan to bring the route underground through Ranelagh in a bid to pacify residents – could have seen the Luas Green Line closed for up to four years. This option was ruled out by Transport Minister Shane Ross as “completely and utterly unacceptable”. On the northside, there was outcry by members of Na Fianna GAA Club when the original plan would have seen them lose their main pitch and two all-weather pitches for up to six years while the MetroLink was being built. Finance Minister Paschal Donohoe, a local TD, and celebrity architect Dermot Bannon were among those who raised concerns about the plan. It’s understood that in the new plan Na Fianna’s pitches will not be affected by construction and the Metro Station in the vicinity of the GAA will be located on an adjoining training pitch used by soccer club Home Farm. More recently there were fears for a €3m facility for Ballymun Kickhams GAA club near Dublin Airport due to uncertainty over the route. However, local TD Noel Rock this evening said that plans for the facility are not in jeopardy as the site is large enough to accommodate both the new pitches and the MetroLink Tunnel boring machine entry location. He said the proposed MetroLink plans are a “definite victory” for both Ballymun Kickhams and Na Fianna GAA clubs. Mr Rock said: “I believe it’s important that we deliver the MetroLink project and it’s important we start now. Green Party leader Eamon Ryan this evening hit out at the revised plans. Sources said that the timeline should remain similar to what was announced last year, with trains due to be running in 2027. The new preferred route is to undergo further public consultation before a Railway Order Application is made to An Bord Pleanala in the third quarter of this year. A decision by the planning authority would be due in 2020 with construction slated to begin the following year. Is it time to have someone else 'have a go' at delivering Metro?